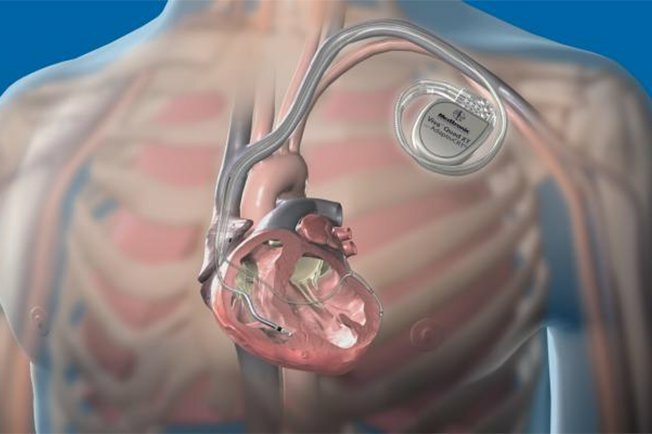 If the heart does not respond adequately to low-level electrical impulses from the ICD, the device will deliver high-energy pulses. The higher energy pulses are very brief (a fraction of a second) but may be painful. Many ICDs also function as pacemakers, another type of device often used for less life-threatening heart rhythms. Implantation of the device is a minor surgery usually performed in the hospital. You will have anesthesia and will likely sleep through the procedure. Through an incision (cut) in the skin the doctor will implant the ICD and run the wires through a vessel to the heart. The ICD device itself is a mini computer and pulse generator so the doctor will test it to make sure it is pulsing properly before closing up the incision. After surgery you will likely remain in the hospital for one to two days to be monitored by your health care team. You may have some swelling and pain in the area where the incision was made. Your doctor may advise against any intense activity or heavy lifting for the first 30 days after surgery. Be sure to contact your doctor if you have any reaction to anesthesia or problems related to the implant, such as bleeding from the incision site, or continued swelling, bruising or infection. You may notice a slight fluttering in your chest, which is normal, or you may feel nothing at all. Also be aware that some electrical devices can interfere with your ICD, such as cell phones, metal detectors and electrical generators. ICD batteries need to be replaced every five to seven years and the wires may eventually need to be replaced as well. You will continue to see your doctor who may recommend additional medications and will monitor your heart’s electrical activity via the ICD.